Well amazingly, we’re pretty much back to normal on all fronts at Hilldale Golf Club…only 48 hours after record (5+ inches) rainfall. There will be no cart restrictions and I think you’ll find the course to your liking…please, just be patient with us regarding green speed and bunker conditions. 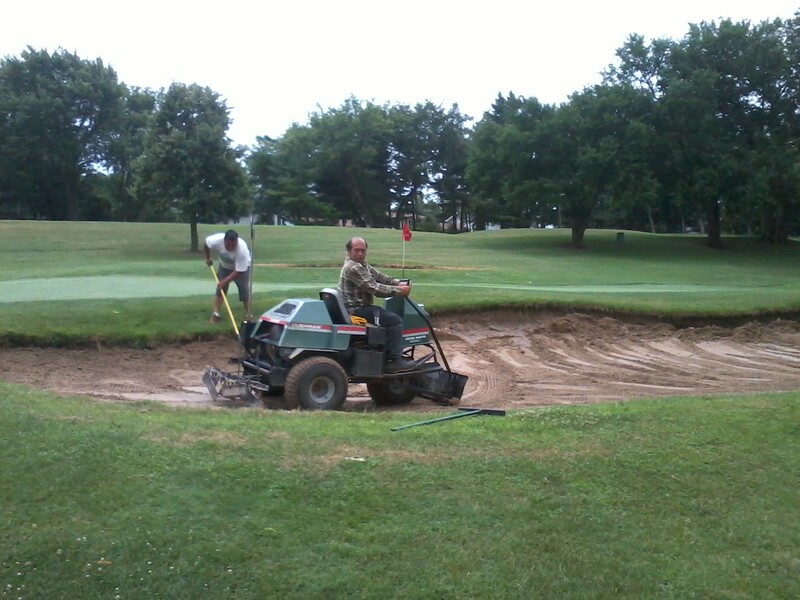 It’s imperitive that we “baby” the greens for several days (especially with more 90 degree temperatures on the way), and as you can see in the picture above…we’re hard at work putting the bunkers back together after the extreme amount of water and subsequent washouts. A heavy downpour plays havoc with bunker conditions…sand gets contaminated with the underlying soil and therefore causes “hard pan” type lies when playing bunker shots…long story short…bunker consistency becomes an issue. We had 5 or 6 heavy rainstorms in 2010, and as many of you know, bunker consistency was very poor last year. So please bear with us as we correct problems left over from an extreme rain event. Thanks and I’ll see you on the course! This entry was posted on Monday, July 25th, 2011 at 2:26 pm and is filed under Uncategorized. You can follow any responses to this entry through the RSS 2.0 feed. You can leave a response, or trackback from your own site.